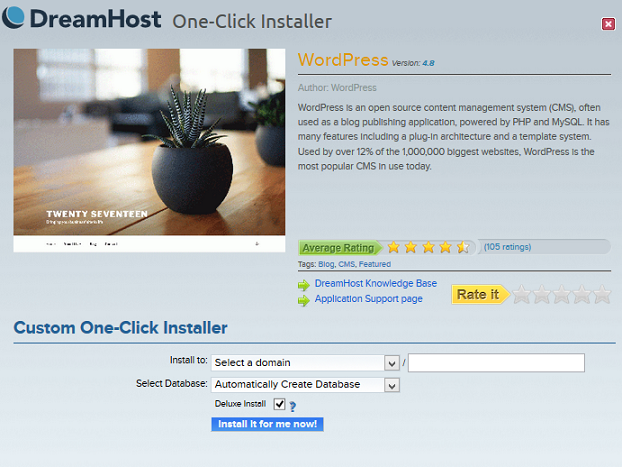 This article covers the process of installing an application using the One-Click Installer in the panel. To install a One-Click, your domain must first be 'Fully Hosted'. This means it can't be Redirected, Mirrored, Parked, Cloaked, or set as 'DNS Only'. Navigate to the One-Click Installs page. Click the icon for the application you would like to learn more about or install. The Application window displays details on the application such as current version and ratings. When you are ready to proceed with the install, select your desired domain from the ‘Install to’ dropdown menu. You have the option to use an existing database for this application or have the panel create a new one for you. Click the Install it for me now! button to proceed with the installation. After about 10 minutes you should receive an email with log in instructions. Follow those instructions to finalize the installation of your site. For WordPress, you can log in at example.com/wp-login.php. 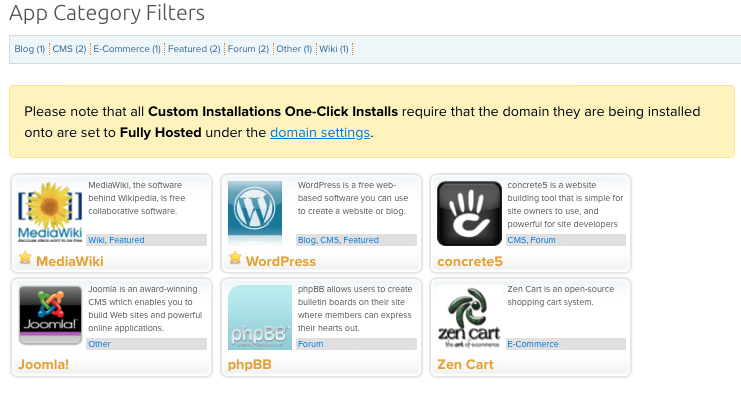 After you've installed your site application, you can view it in the panel on the One-Click Installs page.